Editor Kritika is EMI's big cheese, She is a blogger, social media lover and beauty addict. She love to share her wedding planning experience and about Indian wedding trends. Kids are always excited when it comes to their birthday. They look forward for presents, cake, friends and a wonderful celebration time as it is their day!!! Throwing a birthday party is not always an expensive affair with budgeted birthday party ideas for kids at home. 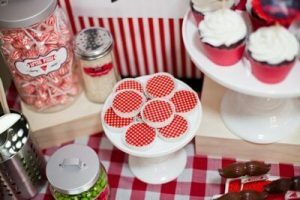 To keep it easy on your pocket, here are some of the most wonderful and interesting ideas to help you throw a kid’s birthday party on a budget. 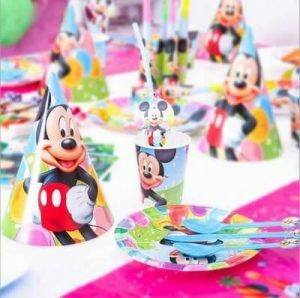 Use these unique ideas to become a perfect birthday planner and have budgeted yet perfect party arranged for your little one. 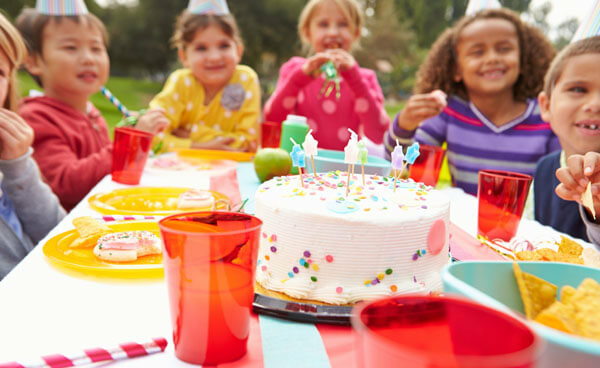 With various birthday party budget templates, you can actually go with fun-filled ideas. 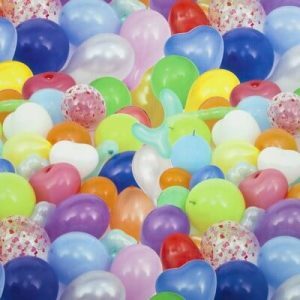 One of the best birthday party decoration ideas is to have is balloon. You can pick one color or go with a combination of colors to come up with interesting and easily affordable decorations that are always loved for kids. Whether it is an indoor party place or an outdoor location, balloons go well with all places. Stuffed bears, bunnies and all other animals make a wonderful birthday party theme without hurting your pocket. You can have a budgeted birthday party food menu with fruit salads and juices on the list along with some finger food to make your party a hit with kids. Cartoons and kids are inseparable. 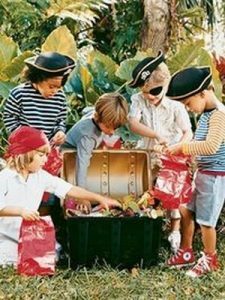 This is a creative and cheap kids birthday party ideas at home as well as outside. With children dressed like their favorite, it is like having your own Disney world at the party. Colorful and cute cut outs of cartoons can be used for birthday party decorations. For a fun-filled celebration idea in your backyard, you can have colorful powders heaped for kids to play with them and enjoy. You really don’t need to spend anything much and have an amazing time with children throwing colored powder at each other. Though it is a little messy but kids enjoy for sure. 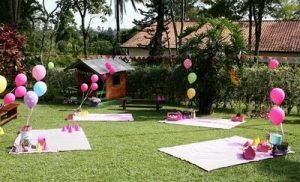 If you have not been able to find a cheap birthday party place near your house then you can use your backyard as the party venue. Set it up with various games to keep them engaged. 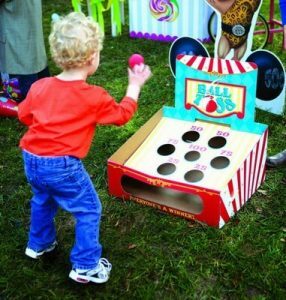 Create a carnival feel by setting up stalls for the games that you have planned. You can take little guests out to some garden as birthday party place for toddlers. Instead of decorations, focus on food and games. With juices, sandwiches, wafers, hotdogs and other easy to make snacks on the menu, get some reasonable party supplies to keep the arrangements low key yet amazing. Do think of some good games to surprise the guests. If you are planning a birthday party for a little girl then get craft theme is an interesting idea. 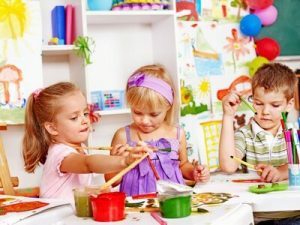 Get some craft goodies and let the kids engage in creating different crafts. Go for some unfinished goods like t-shirts, photo frames, wooden trinket boxes, unpainted pottery, bags etc and let them decorate these things and take them along. Hide small little gifts in different corners of the party place. Create some clues and let the treasure hunt begin. Kids are going to find this theme super exciting as they get to follow the clues and reach the treasure. Use your creativity to come up with interesting clues and make sure you wrap these gifts uniquely. Bring on some veggies and fruits and give your guests aprons and chef caps to begin the party. Let children make salads, sandwiches and have a birthday party of their kind. Let them enjoy making fire free foods just by assembling different things. Make sure you assist them as and when they need your help. Molten chocolates with different moulds are a wonderful surprise for children. Let them be creative and let them use their skills to create chocolates using different moulds, nuts etc. 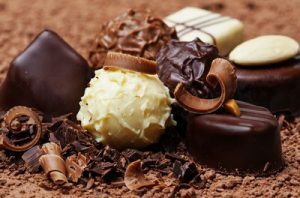 This is another budgeted party idea which will be loved by the little chocolate lovers. 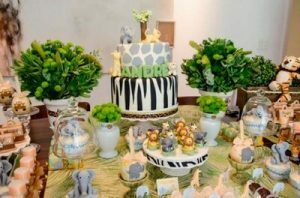 With such amazingly creative and unique budgeted party ideas, you don’t need to worry what to do on your baby’s special day. Use these ideas your way and make it a memorable day for your darling sweetheart. No matter if the parents are separated or divorced, love for their child is never lost. Inviting divorced parents to wedding might be a bit tricky when it comes to finding the best text matter. We have a collection of the most hearty text messages and wording to help you encrypt on your wedding invitation addressed to your divorced parents. 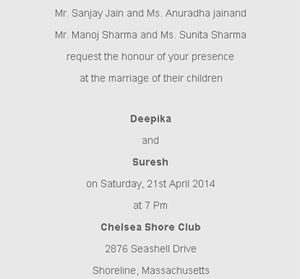 Here is a sample example of invitation wording for inviting your divorced parents. Bridal shower is the pre wedding celebration where the friends of the blushing bride spoil her with lovely gifts for the upcoming wedlock. These parties in India are celebrated as grand as the wedding itself. 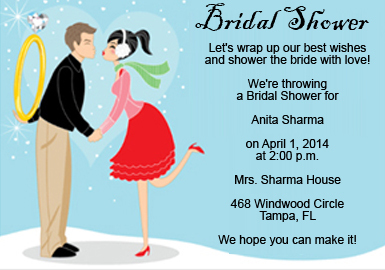 Invites with lovely text matters are sent to the guests with a preview of the shower theme. They also include time, date, location, address, guest of honor, and the host of the party. Below is a sample example of a creatively classic bridal shower invitation wording that will make your party all the more special. and shower the bride with love! Indian Hindu Weddings are celebrated with great prom and gander. 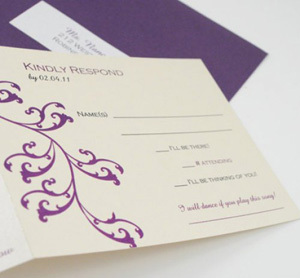 Why not use your creativity in the invitations too? Our collection of sample invitation wordings definitely comes a long way to help you in the preparation process. Our sample text matters are fun-filled and urge people look forward to your wedding. Who has no idea what he’s gotten himself into. We’ve waited a lifetime to celebrate this beautiful union. Our Rass Garba wedding invitations suites are sure to impress your guests. Get ready for an elegant and most cherished wedding with our lovely collection of sample text matter and wording examples to compliment the occasion. 5.00 p.m. to 9.00 p.m. The world runs on a single click. Let’s talk wedding. Indian style email wedding invitation is on hot sale today. It is a simple yet elegant way to present your digital wedding invitation to your guests who are too far away. These invitations come with their own advantages. Here is a sample letter format with text messages and wordings for better understanding. Suddenly there was an epidemic of happenings….. Wondered where were we leading to? And here we are today sharing our good news!!! The time has come where we have to bid adieu to our single lives and make a transition. To bless us on the auspicious nuptial lock. Please consider it as our personal invitation and grace the special occasion with your presence. It will be highly anticipated! Ladies sangeet is a part of Hindu weddings. It is one of the ceremonies done before the day of wedding. All ladies of the society of bride side and broom side separately organize a get together to enjoy and dance on songs they sing. They dance on movie songs related to bless bride and broom. They sing about the wedding couple so live happily ever after. Men are also allowed to attend the ceremony according to the societal traditions. 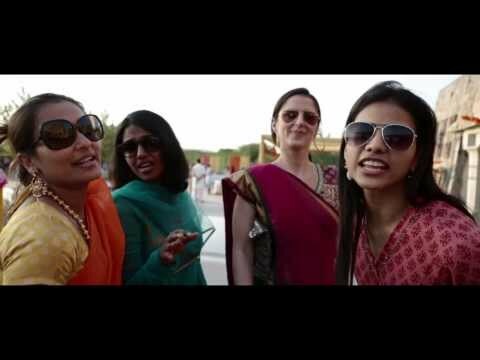 There are different traditional songs in various languages and movie songs in India for ladies sangeet. You can enjoy and dance on the songs on the occasion. The song is from the movie Hum dil de chuke sanam sung by Kavita Krishna Murti. Aishwarya Rai Bacchan danced well on the song. It has catchy words which you can easily sing. 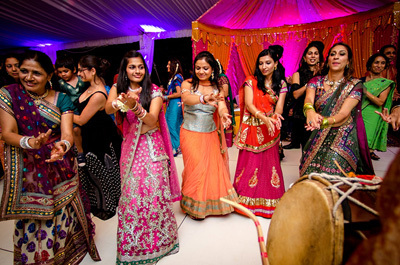 It is a good dance number on which you can give performance in ladies’ sangeet. Tum hi ho bandhu and second hand jawani is a good peppy dance song on which you can perform on stage. The song is catchy and composed by Prittam. He is one of the famous bollywood music directors. Young ones will love to dance and shake hips to the songs. The song is one of the old and famous songs for ladies’ sangeet ceremony. The song has picturisation of ladies’ sangeet itself in the movie (Chandani). The song is picturised on Sridevi, the famous actress of the oldest time. The song was picturised on Madhuri dixit and Aishwarya Rai Bacchan. 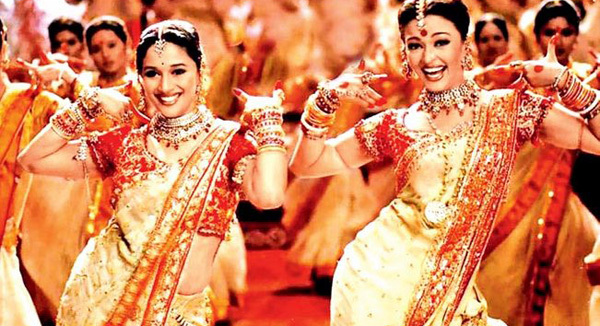 Both actresses danced very well in the movie (Devdas). The song is a peppy dance number and has grand backgrounds. It is mostly played in ladies’ sangeet. The song is taken from the movie Hum Apke Hai Kaun. The song is picturised on Madhuri Dixit and Salman Khan. The actress was looking stunning in the song. 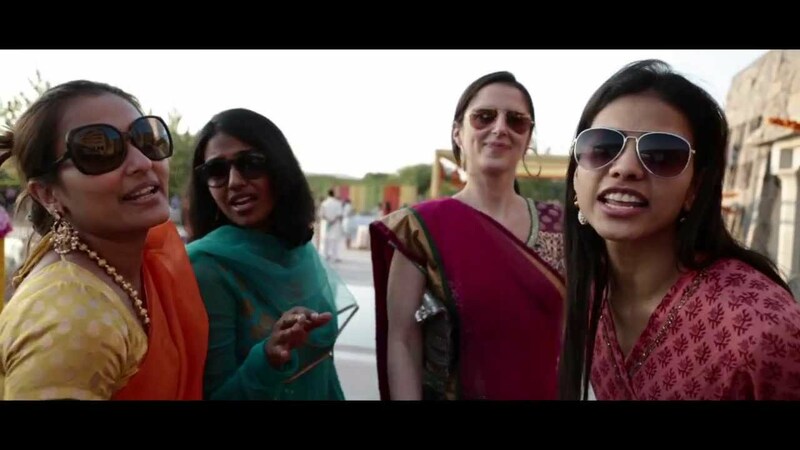 The song is a pure ladies’ sangeet as picturised in the movie. It is one of the popular ladies’ sangeet songs. 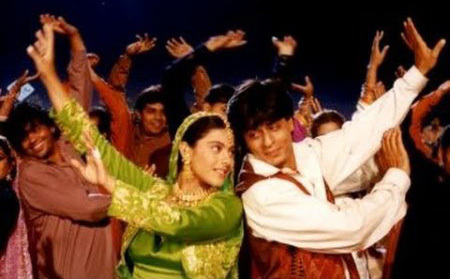 The song is taken from the movie Dilwale Dulhaniya Le Jayenge. The song is the old and evergreen for ladies’ sangeet ceremony. It is always the first choice of the broom side to dance on the song. 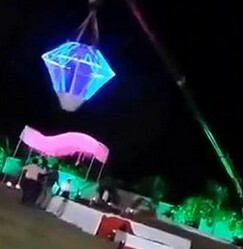 The song is a popular ladies’ sangeet song. These kinds of songs are sung for the bride and to bless her. Vidai songs are also a part of ladies’ sangeet. It is basically sung at the end of the ladies sangeet to give an emotional touch to the occasion. The songs are sung in the regional languages in India. The songs are sung for the bride and broom. They are the valuable part of ladies’ sangeet due to their emotional touch. The song may differ in the languages like Sindhi, Bengali, Punjabi, English, Assamese, Marathi and many more from different parts of India. The singer is famous for his signature Punjabi genre. He is a Punjabi rap singer. His famous songs are Blue Eyes, Angreji Beat and Brown Rang. He is popular amongst the youngsters. Youngsters will love to dance in ladies’ sangeet. Those were the list of best songs for ladies sangeet on which you move your body and enjoy, now select one of the songs above songs and starts practicing for your best performance and get compliments. To get more information about the Indian weddings, you can follow this link to know more sangeet songs for Indian wedding. Planning on popping the question? Then you must be looking for ways to find that perfect engagement ring that will show how much you love your partner. An engagement ring is a long term investment, not just in money terms, but also because every time you will glance at it, it will remind you of the love you share with your partner. Planning ahead is always better than regretting later on. Here are the most important tips for finding a perfect engagement ring for your beloved. 1. Estimate your budget: it is often said that an engagement ring will eat up two months worth salary. Planning ahead on budget helps in knowing your price range and is also helpful to the jeweler. Knowing your affordability in advance helps you not to feel cheated afterward, or regret. But always keep in mind that the budget may go up, be prepared for it. 2. Choose a good jewelry store: choose a store which has all the certificates. Try to avoid chain stores. You can ask for recommendations from friends and family. The jeweler should be able to customize your preferences if need arises. Also the store must be friendly and comfortable as choosing an engagement ring is a stressful task. 3. Discuss with others: you may want to know other people’s experiences. Search online or discuss with your married friends and family persons. You can even take someone with you when you go shopping. Discussing will give you ideas and make you more prepared. 4. Pay attention to her jewelry choice: listen carefully whenever she/he discusses jewelry or try to gauge your beloved’s tastes and references through actions and getup. Discuss jewelry, especially rings just casually with her. Know her size beforehand. Either you can take your partner to along with you to shop for the ring, or if you are planning on surprising, then take into confidence her mother or best friend. Remember, it’s not you who would have to wear the ring every day, it’s your partner. 5. 4 Cs and then the 5th one: studying ahead about the ring you are going to buy helps you in choose the best ring. The most important chapters of a ring guide are 4 Cs- cut, carat, clarity, and color of the stone. Add to it a 5th C- cost. Choosing a ring which is not purely diamond and platinum but can easily pass for one for years to come can be a good option for your budget. Who cares if the solitaire is 18 carat or not, a cubic zirconia is cheaper as well as looks exactly the same. You may want to consider these options before buying the ring. Cut of diamond can enhance its sparkle and beauty. Clearer the diamond, higher will be the price. Know the scales which are used to measure clarity and color of a gemstone to gauge its accurate price. 6. Research thoroughly: know all about metals, gemstones and setting beforehand. Cost of metals, whether platinum or gold, solitaire of some other, and setting of stone on band will guide you a lot when you will go to the store and will have numerous choices in front of you. A thin band around the stone may give the illusion of it being bigger, or a combination of metals and style can increase durability of the ring. 7. Practicality and durability: practicality and durability are most important things to make the ring last lifelong or even be converted into heirloom, to be passed on generation to generation. Know beforehand, what type of ring will suit her the most and retain its shape and size ever after years of wear and terr. If your partner loves outdoor activities, a lower gemstone setting is preferred, or if she is fashionable, then finds the latest trends. Platinum is more durable than gold, or for more durability, get an alloy of titanium and white gold for the band. 8. Purchase before proposal: you may not be able to get the ring immediately. Or you may opt for a customized ring. 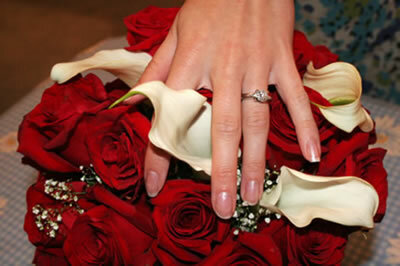 Plan the date of proposal well in advance, so that you may have the ring ready on time. Notify you jeweler about the expected date and collect the ring just before proposing so that you don’t have to worry about keeping it safe. 9. Get it insured: the ring should be bought with an eye for trading it up in future, so that you may not be at loss when in future your spouse changes his/her ring for a grander one. Also protect yourself against theft, get the ring insured. You are spending hard earned money on it, it’s worth it. Even if you have to pay your premium, so what! You have invested time and money for the ring. Get consultation for good insurance company. Have it numbered so that it will not get exchanged when out for polishing. 10. Get in writing: ask for all the certificates and warranties. The make, style, cut and cost should be with you in writing. A gemologist’s certification helps in long-term investment in the ring. Now you are fully prepared to get the engagement ring. Decide upon the setting and go, pop the question. All the best wishes for you, good luck! Know about the dos and don’ts to be at peace with your guests at your wedding day.